Sports hall athletics area final. 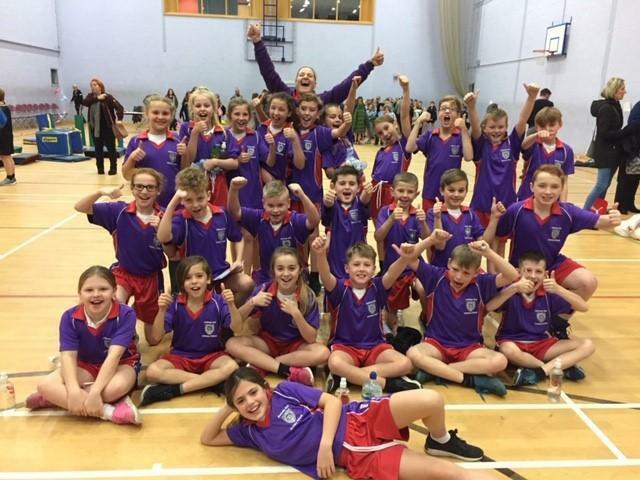 On Tuesday January 29th, our Year 5/6 sports hall athletics team took part in the area finals. They had spent many lunchtimes practising under the watchful eye of their coach - Mrs Johnson. We knew it would be a tough competition as there were three other very much larger schools than us taking part. There were field events such as javelin, chest throw and standing jump and then different track events. With only 2 events to go, we were narrowly in the lead so it was all down to the final 2 races. It was very close but poor Tilly tripped and fell over. Even though she had clearly hurt herself, she got straight back up and continued running. As they read out the results we were convinced that we were second, but when they read out "First place.... Anthony Bek" we screamed with delight. It was an amazing feeling to come first, the effort by all the team was fantastic and Mrs Johnson lost her voice because she shouted and cheered so much. Thank you to all the parents who came to support us and Mrs Johnson who coached the team so well. Look out for our names in the County final which takes place later on this year.